Imagine a scenario like this. You invite a CEO of a successful start-up company to speak to your students. Your wish has been to drive the message home to students that they do not have to live with a constant defeatist mentality. If they try, perseveringly, again and again, they can, at the end, succeed. No need to give up if you have failed even a hundred times. The speaker under reference walks to the stage with an unusual implement hanging over his shoulders, a guitar. The students who normally consider these ‘do-good discourses’ as boring suddenly wake themselves up to the new scenario unfolding before their eyes. Bemused, they continue to watch, not knowing what would happen next. The lone guitarist does not keep them in suspense for long. He summons to the stage either Simon and Garfunkle or Mervin Perera in a solo performance. His half-closed eyes show that the melodious voice that comes out through his lips has begun its journey from somewhere deep in his heart. All the time, his busy fingers pull the strings of the guitar creating a harmonious melody. It is over in a few minutes. But by that time, the students who had previously been unwilling and disconnected have now been transported to a new world in which the focus has been only on the speaker and nothing else. Thus, both the speaker and the students have been attuned to the same wave length. The speaker is ready to begin his discourse and the students are ready to listen to him. This is the performance that is repeated everywhere this speaker appears, no matter whether it is at the University of Sri Jayewardenepura or the University of Kelaniya or the Business Management School, to mention but a few places (The performance at the Kelaniya University can be accessed at: https://www.youtube.com/watch?v=65VESkLxozU.). This lone guitarist is Rohan Pallewatta, Executive Chairman of the start-up high tech company, Lanka Harness, a Board of Investment or BOI approved company operating in the Free Trade Zone at Biyagama in Sri Lanka. To pick the brain of this man on this as well as on many others, I sit with him in his spacious boardroom, sipping steaming tea, one cup after the other. Rohan is unusually calm and his calmness has defied my perception of a CEO: a busy-body constantly spying on his wristwatch as if the world would come to an end in a few minutes’ time. Locked up alone in his boardroom, we have all the time under the sun to exchange views. At the end, I leave him wiser than before. It was an unusual teacher-student relationship, entirely driven by demand, so that results were fully effective. The beggar-guru was able to unleash a talent which had been in hiding in Rohan all the time. Today, to Rohan, a guitar is just like a pen to a writer. Singing, its complementary product, is the natural flow of water coming out of a stream. His marriage with the guitar and singing reminds me of the American philosopher academic Robert M. Pirsig who travelled the length and width of USA on a motorbike in search of the philosophical foundation of human knowledge. The outcome has been the semi-fictional inquiry into science titled ‘Zen and the Art of Motorcycle Maintenance,’ a book recommended for advanced microeconomics courses in many North American universities. The motorbike was the guitar of Pirsig. One day, Rohan would also put pen to words to present his narrative. It will not be a challenge for him with his honours degree in English literature from the University of Kelaniya. When I meet people like Rohan who use English language fluently, I always ask them how they got that talent. The purpose is to impress upon others that learning a foreign language is not rocket science and everyone could do it if they take it seriously. Rohan says it was by compulsion rather than by choice. At St. Anthony’s, the rule during his time had been a total prohibition of speaking one’s vernacular language. There is this slab called DTV, standing for Don’t Talk Vernacular, passed by the Principal to a Senior Student of choice to administer it. His identity is not known to other students. If somebody speaks Sinhala or Tamil, DTV is promptly passed onto him. If you get it, it is fatal for you because you would be caned at the assembly the following morning. A modern student rights activist might say that it is a brutal way of teaching. The means could be questioned, but the end has been a happy one as demonstrated by Rohan. Thanks to this brutal method, Rohan who had not done English as a subject for GCE (AL) Exam was able to read for an honours degree in English literature later in his life. 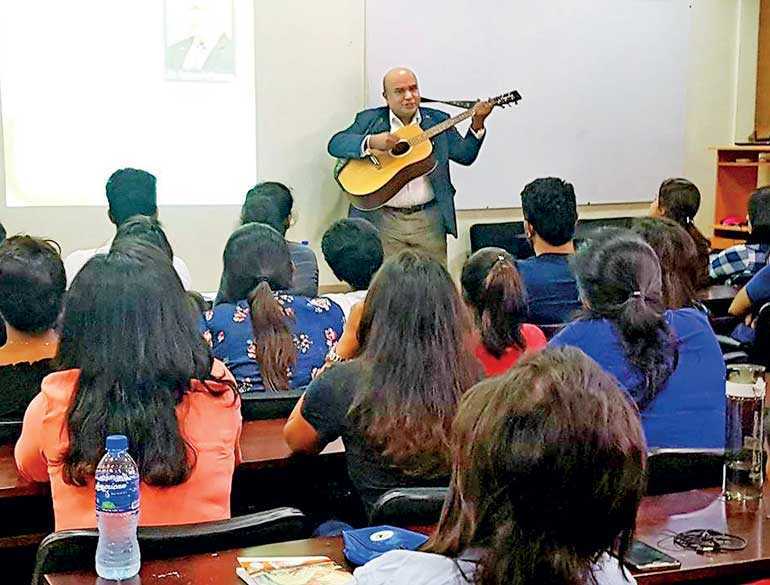 Many years later, his English helped him to complete his Attorney-at-Law at the Sri Lanka Law College and MBA at the Postgraduate Institute of Management. Our conversation naturally switches to his entry to the entrepreneurial world. After his O/L exam at St. Anthony’s, Rohan had got a scholarship from the American Government under its American Field Students Programme. Says Rohan: “I could have chosen one of the Western countries like USA, UK, Australia or NZ to study for one year in one of their schools. But Japan was also a choice. I chose Japan because I wanted to master martial arts and earn a black belt. I earned the black belt. But as a part of the study programme, we had study tours at leading Japanese companies. When I visited Toyota, what struck me was that most of its processes had been done by robots and humans were barely visible. “But in one of the rooms, I found there were a lot of people and, on inquiry, I was told that they were producing a very critical component which robots couldn’t do. That was the production of sensors which automatically got activated on impact to release an air bag in the event of an accident. It’s a life-saving gadget and Toyota couldn’t rely on either robots or outsiders to produce it. Hence, under their strict quality supervision, it was produced in-house by its own employees. Rohan submitted some of his samples to Toyota to get their nod for it. But the subsequent period was a total disappointment for him. Toyota at first rejected them. But when he started to send more samples, it did not even acknowledge them. A plus point for Rohan was that he had mastered the Japanese language whist being a student in Japan as an American scholar. So, he knew the Japanese habits, culture and values. The Japanese loved it if they were met in person rather than in correspondence. So, Rohan started to shuttle between Colombo and Tokyo in order to win a franchise for his product from the world’s largest car manufacturer. Totally frustrated, at one of the meetings he asked the Toyota people why they did not even acknowledge the samples, let alone accept them. The reply was more disappointing. He was politely told that he was such a nuisance to Toyota that when they saw any package bearing his name on the envelope, they would throw it into the dustbin without even bothering to open it. For anyone, that reply would have been sufficient to say goodbye to his entrepreneurial ambitions. But not for Rohan, who is now determined to prove that Sri Lankans also can do things which others can do. “I negotiated with Toyota for 15 long years without success,” reminisces Rohan. “By that time, I had shuttled between Tokyo and Colombo 46 times and I didn’t know where my negotiations would lead. But that led to a further period of unsuccessful negotiations with Toyota’s 10-odd sub-contractors. Rohan started to send his home-produced samples to them. After sending about 100 samples, he got the reply from one of the sub-contractors that two of them were not bad. “Though it was not a word of acceptance, it was like a straw that had come the way of a drowning man,” he says. The world has been changed by people who worked as loners, most often in their houses. The first Apple Macintosh Desktop was invented in the backyard garage of Steve Jobs’ adoptive father. Despite its unholy beginning, it changed the entire world in the subsequent few decades. Similarly, Rohan’s amateurish work at his home paved the way for a new era in Sri Lanka. 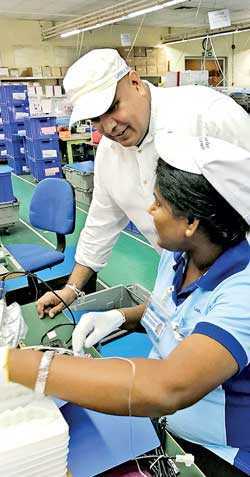 That was the sowing of the seeds of a high-tech production era in the country and effectively using the global supply chain to create wealth for Sri Lankans. The modern production method is not to produce a whole product by a single country. It is global production sharing as coined by the Sri Lanka-born economist at the Australian National University, Professor Prema-chandra Athukorala. The advancements in ICT, marine and air transportation and diffusion of knowledge have enabled different nations in the globe to cooperate with strangers to produce global products for the global market. Thus, today’s citizens are not natives of nation states. They are global citizens. Today’s products are not owned by these nation states. They are owned by the entire globe. For instance, components for iPhone 6 are supplied by 740 odd production units located in 31 countries (available at: https://betanews.com/2014/09/23/the-global-supply-chain-behind-the-iphone-6/). They are finally assembled at the Foxconn Assembly Plant located in China. Each country supplies only a minor component. But they create wealth by producing big volumes running into billions. Noting this global trend, the present Government has pronounced that its strategy is to join the global production sharing net. Today, Rohan’s Lanka Harness is a high-tech production unit directly employing about 450 and engaging about 500 subcontractors. Thus, it provides livelihood to about 3,000 families. This is not much, but it is the beginning. Its success should be an eye-opener for others. Rohan’s products should be absolutely defect-free since there is no way to check on their efficacy before a vehicle meets with an accident. Thus, the benchmark quality standard given to Rohan is that the defects should not be more than one PPM or one part per million. That is a very high quality standard and it is unthinkable for a Sri Lankan firm. But Rohan and his team have proved the unthinkable. That is, Sri Lankans can also do things better than others. He supplies to almost all the major car manufacturers in the world, accounting for about 7% of the global market for sensors. A visitor entering his factory will observe boxes of finished products marked for countries like Japan, South Korea, Malaysia, Thailand, Indonesia, India, Germany, Romania, UK, and USA, covering practically every country that produces vehicles. With his track record for quality, timely delivery and customer-friendliness, the market is expanding day by day. At present, it is a $ 100 million export firm. With a new facility now coming up close to the original factory at Biyagama soon, it will be a $ 200 million export firm. Not many people know of Rohan’s achievements and contributions to the country’s economy as a lone producer. He is hidden from the limelight. That is because he does not produce for the local market. But whoever who is driving a car here should know that his life-saving gadgets within the car may have been supplied by a small start-up company created and developed by Rohan. A good example is the encounter of a batch of his employees sent to Japan for short-term employment at his Japanese principal. They had been driven around the city by their Japanese counterparts in a coach. When they had alighted from the coach, they had been told, to their pleasant surprise, that the life-saving gadget fixed to that vehicle had been produced and supplied by them. That alone had been the motivational factor for them to return to Sri Lanka and work hard to produce more quality products. Sri Lanka’s future depends on its ability to become a partner of the global production sharing network. Rohan Pallewatta has been one of the designers of that future.